Friday nights in October were spent in chilly, silver bleachers of the Barbe Buccaneer’s football stadium in Lake Charles, Louisiana. At a young age, I adored these nights. Not because I enjoyed football, or even understood the game to be honest. It was the idea of everyone being together, cheering for the same team, and consuming vast amounts of food while watching others exercise. I had never seen so many people consume so many peanuts at one time. As the stress of the game grew, or the heat of many in-crowd “conversations” (some like to call them insults) progressed, the peanut shells went flying. The burnt red skins along with the tan shells looked like tiny autumn leaves floating in the air. This was the closest I ever got to fall foliage in Louisiana. So, there I would sit in the crowd, attempting to fit into the madness. I rested on the bleachers with a fist full of peanuts, trying desperately to crack them between my fingers like the rest of the seasoned adults. Finally, I did what kids do best. I used my God-given tools and cracked the shells with my teeth. And there, lying in my fingers was my prize. Happily continuing with my method, I became not only a spectator of this sport but a partaker as I downed an entire empty Coca-Cola cup filled with peanuts. The game was going into overtime, whatever that means, whenever I noticed that all of the peanut skins were not floating like the others. They were sticking to the shirt of the man sitting directly in front of me. My head began to fill up with ways to remove the peanut remnants without being caught. Suddenly, there was a gust of wind and I began to attempt to blow at the stranger’s shirt at the same time, hoping that no one would notice. Ineffective. Then, everyone started to stand up and cheer in unison. This was my chance. With both hands, I tenaciously started patting the back of the peanut- covered stranger. He turned around and just smiled at me with two thumbs up. I returned the gesture just in time to see a lovely scene of autumnal foliage flying around between us. Success. This recipe takes me back to those chilly Friday nights, eating copious amounts of peanuts and loving every minute. 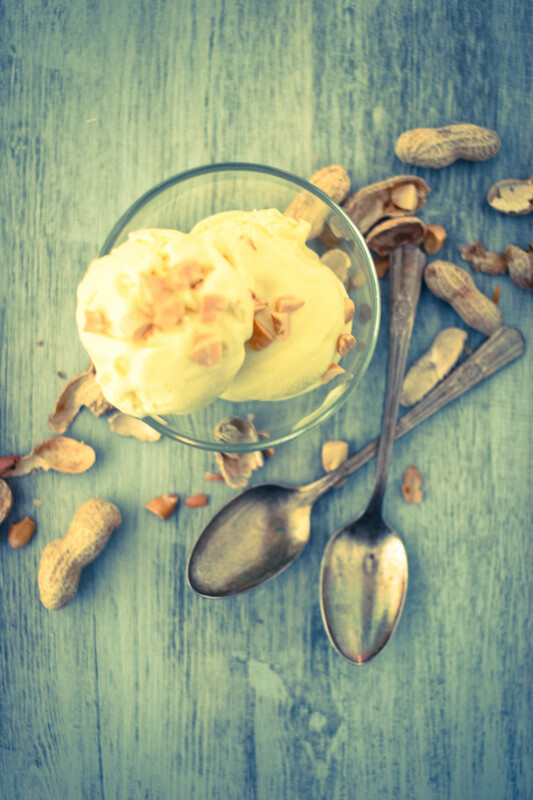 In a small saucepan, heat the cream and peanuts together until it begins to simmer. Turn off heat and allow the peanuts to steep in the cream for a few minutes. Strain mixture and discard peanuts. In a mixer fitted with a whisk attachment, whisk egg yolks and sugar together until the mixture has become pale yellow in color and thick. With the mixer still on low, slowly pour in cream. Whisk until all of the ingredients are combined. In a double boiler (or a pot of simmering water fitted with a larger bowl on top) stir the mixture together until thick enough to coat the back of a spoon. Put the ice cream base in the fridge until fully chilled, about 2 hours. mmmmmm this was so good! AWW!! 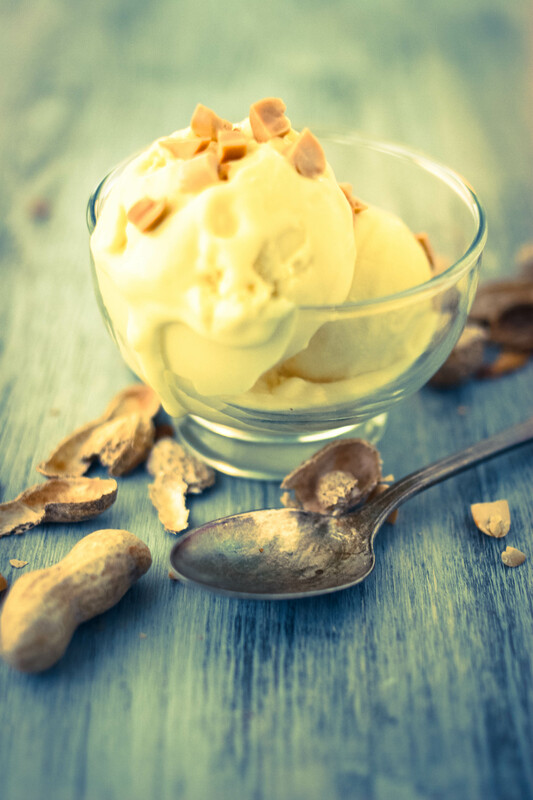 I love your story that goes along with your delicious peanut ice cream! I could just sit all day and down your ice cream while watching football!! 🙂 Lovely! Thank you so much! Ice cream goes well with athletics!